The year 2013 was supposed to be momentous for Turkey's strongman, Prime Minister Recep Tayyip Erdoğan. Having established himself as the single most powerful Turkish politician since Kemal Atatürk, he sought to transform Turkey into a presidential republic in 2013 then accede to the presidency in 2014 where he could remain until the republic's centenary in 2023. But toward the end of the year, the tables turned. Far from looking forward to a decade of uninterrupted rule, Erdoğan's hold on Turkey looked increasingly fragile, and many began asking how long he could stay in power. Massive protests broke out across the country against Erdoğan's heavy-handed repression of demonstrators seeking to preserve Gezi Park, one of the last green areas in Istanbul. Some analysts are comparing recent events in Turkey to those in Egypt's Tahrir Square in 2011, which brought down Hosni Mubarak. Below the surface, dark clouds had gathered for some time as Erdoğan's domestic and foreign policies combined to alienate important sections of his own ruling coalition. But things came to a head in the summer of 2013 when massive protests broke out across the country against the prime minister's heavy-handed repression of demonstrators seeking to preserve one of the last green areas of Istanbul, Gezi Park. Only weeks later, Turkey's increasingly sectarian foreign policy in the Middle East collapsed when Muhammed Morsi was ousted from power in Egypt. Turkey's interventionist stance on Egypt, coming on the heels of a regime change policy in Syria, had led it to regional isolation. Then in December 2013, Erdoğan's regime cracked when prosecutors leveled serious corruption charges against four of his closest cabinet members. Erdoğan's year of crisis raises two important questions: First, what led to the series of crises that undermined his hold on power and thwarted his presidential plans? And second, can the prime minister restore control or has his hold on power irrevocably crumbled? Erdoğan's political evolution can basically be described as a ride from radical to moderate, and back again. He emerged as a young firebrand Islamist, famous for his scathing disdain for Turkey's secular order. In the 1990s, he styled himself "the imam of Istanbul" in an interview and once remarked that, contrary to Atatürk's famous dictum, "sovereignty belongs unconditionally to Allah," not to the people. Most famously perhaps, he referred to democracy as a streetcar: "[W]e will go to wherever we're going, and then get off." Meanwhile, he showed talent as a manager and was widely praised during his tenure as mayor of Istanbul—that is, until one of his vitriolic speeches landed him in jail on charges of inciting hatred following the 1997 military-led ouster from power of the Islamist Welfare Party. This was a crucial turning point in two ways: First, it built an aura of victimization that enabled Erdoğan to emerge as leader of the Islamic conservative forces that similarly styled themselves as having been victimized by seventy years of secular rule. Second, it led him to adopt a considerably more moderate style and rhetoric. Gone was the firebrand, replaced by the moderate democrat. This more collegial approach persisted through the first term of the Justice and Development Party (Adalet ve Kalkınma Partisi, AKP). Erdoğan was prime minister, but Foreign Minister Abdullah Gül wielded nearly as much influence and played a crucial role as a balancing and moderating force on Erdoğan. Two others were also part of what was in effect a quadrumvirate running the government: Bülent Arınç, perhaps the most outspoken Islamist in the ruling elite and speaker of parliament, and in the initial phases, Deputy Prime Minister Abdüllatif Şener, who was out of decision-making within a year. In the AKP's second term, various circumstances led Erdoğan to emerge as the sole leader of the government and party. Gül was elected president, which removed him from day-to-day politics, and Arınç fell out with Erdoğan over the presidential election. 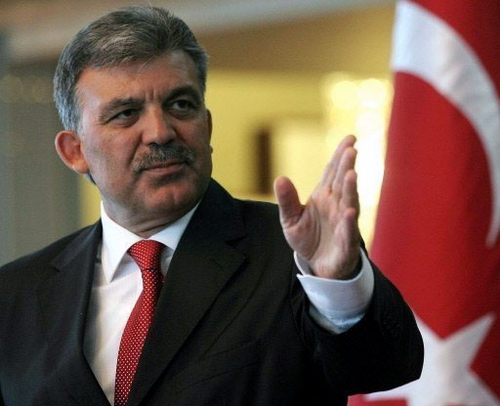 Erdoğan did not want a person with as strong a profile as Gül in the presidency. In order to avoid the wrath of a military that he still feared at the time, he agreed to the top brass's demand to nominate a candidate without an Islamist past. Arınç, however, threatened to run himself unless the AKP nominated a "religious" candidate, forcing Erdoğan's hand and leading to Gül's nomination. However, in the AKP's second term, Arınç was not re-elected speaker and failed to get a cabinet post. Erdoğan was now in sole command of the party. As early as 2008, the change in leadership style was visible. Gone was the Erdoğan who patiently allowed debate even on small issues; instead, another appeared, increasingly intolerant of criticism and deaf to advice and debate inside or outside the party. Observers noted that most AKP deputies lacked the courage to demand an appointment with Erdoğan. Party group meetings were turned into a private stage for Erdoğan, and deputies were not expected to speak or ask questions. The same pattern developed in the council of ministers. Outside government, the prime minister began taking a harsh tone toward any criticism directed to him from media. This began with his outbursts against secular-minded media that criticized a new amendment to the constitution opening the way for greater wearing of the Islamic veil in official situations. It continued over allegations of corruption involving an AKP-affiliated charity in Germany, the Deniz Feneri. Whether spontaneous or planned, Erdoğan's outbursts against journalists and media owners became commonplace, and a form of self-censorship rapidly descended over the media. Gradually, a disturbing pattern emerged of journalists being fired after having been publicly criticized by the prime minister. By early 2010, Erdoğan had his eyes set on a new post, the presidency, but not under Turkey's semi-presidential system of government. As early as April 2010, he declared his interest in a presidential system. Erdoğan's appetite was whetted by the constitutional amendments approved by referendum in September 2010, whose effect was to overturn the secular establishment's control over the judiciary. Immediately following this referendum, supported by 58 percent of the population, Erdoğan publicly announced that he now aimed to write an entirely new constitution following the June 2011 parliamentary elections. Just as Erdoğan succeeded in removing the threat to his power posed by the secular establishment in the military and the judiciary, he capitalized on this not to usher in the promised liberal order but to single-mindedly concentrate power in his own hands. In so doing, he rapidly changed the main fault line in Turkish politics. Gone was the traditional Islamic-secularist divide; the struggle was now between advocates and opponents of one-man rule. This also opened a fault line within the Islamic conservative movement itself. Indeed, the movement was far from united behind the idea of another decade of Erdoğan as strongman and president. Erdoğan's increasingly authoritarian traits had already begun to cause concern within the movement. An important, centrist faction loyal to the more conciliatory posture of President Gül opposed Erdoğan's ambitions. Even more importantly, so did Turkey's largest social movement: the Fethullah Gülen community, popularly known as the cemaat. Over the past three decades, this community has grown into a globalized movement involved in education, business, and media, led by its founder from a resort in rural Pennsylvania. Moreover, its representatives are known to have influence in key areas of the bureaucracy, such as the police and judiciary—but importantly, also in the middle ranks of the military. Erdoğan appears to regard himself as the embodiment of the national will—with the result that his tastes, prejudices, and opinions become those of the nation, regardless of whether or not the nation is aware of the fact. Erdoğan summed up the rationale behind his interest in this broad range of issues: "I am the country's prime minister. Every issue is my concern." The reasons behind this personal journey remain debated. Some suggest that power simply went to Erdoğan's head. Others believe he is merely becoming the politician he once was, implying that his caution and moderation from 2001 to 2008 was mainly tactical. And indeed, there is a direct correlation between Erdoğan's consolidation of power and the resurgence of his authoritarian and Islamist pronouncements. Erdoğan's increasingly conspiratorial worldview should also be mentioned. His lashing out at imagined foreign foes for Turkey's problems is often viewed as tactical, but there is reason to believe that Erdoğan and his key advisors truly believe many of their conspiracy theories, particularly those involving world Jewry. To note but one example, in 2013, Erdoğan hired Yiğit Bulut as a chief advisor, best known for his assertion that people around the world were trying to kill Erdoğan using telekinesis. There is one further element to the Erdoğan puzzle: the state of his health. In November 2011, the prime minister underwent complex surgery that, according to the official version, removed a benign growth on his colon. A further minor surgery was performed in February 2012. While not publicly confirmed, several sources report informally that Erdoğan underwent a third surgery in April 2013. While Turkish media sources have been circumspect on the issue given the prevalent self-censorship, there is a widespread consensus that Erdoğan is undergoing treatment for colon cancer. He has repeatedly rejected these notions, but in a video clip on a visit to a hospital in Adana in May 2012, Erdoğan can be seen telling a woman receiving colon cancer treatment "we share the same illness." As in any political system dependent on one individual, Erdoğan's health is a crucial factor in Turkish politics. This is true both for understanding his rhetoric and policies but also for understanding the ongoing power struggle. In early 2012, various media reports citing Western diplomatic sources observed that Erdoğan appeared to be "acting with a sense of urgency." Many attributed this to his deteriorating health and to an expectation he may not be politically active for very long. Indeed, his health appeared weak during 2012, and he regularly cancelled or missed appointments. However, in 2013, his health seemed to improve again, leading some of the speculation to subside. Politically, it is notable that the first time that President Gül vetoed a law passed by Erdoğan's government was in December 2011, coinciding with the prime minister's first surgery. Similarly, a prosecutor's attempt to interrogate Erdoğan's intelligence chief Hakan Fidan occurred at the time of the second surgery, in February 2012. These may be pure coincidences but raise the question regarding the extent other forces in Turkey's politics plan their moves on the basis of assumptions and information about Erdoğan's health. A power struggle over Turkey's presidency has developed between Erdoğan and his one-time ally, current president Abdullah Gül (above). Where Erdoğan has become increasingly authoritarian, Gül has refashioned himself as a spokesman for democratization and reform. As Erdoğan has retreated from integration with Europe, Gül has emerged as an advocate for closer ties with the EU. In his ambitions to turn Turkey into a presidential republic and accede to the presidency, Erdoğan faced one key obstacle: his long-time brother-in-arms, Abdullah Gül, who held the post. When the constitution was amended in late 2007 to have the president directly elected, the amendment made no reference to whether the incumbent president would serve under the old or new system. Thus, until 2012, no one knew whether Gül's term would end in 2012 or 2014 and whether he could be re-elected. But Erdoğan did not wait. Having purged Gül supporters from the party ranks ahead of the 2011 elections, he made his first direct move against the president in January 2012. Parliament passed a law stating that Gül was bound by the old rules, implying he could not stand for re-election. Yet the same summer, the Constitutional Court handed Erdoğan a blow, resolving that Gül's term was seven years but that he could be re-elected for a further five-year term. From that point, the space for compromise between the two men shrank considerably. The episode also indicated that Erdoğan was not in control of the courts. Presidential politics explain much of the two men's posturing since then. Erdoğan has kept pushing for a presidential system, and his posturing on the Kurdish issue is largely conditioned by his need for further support to reach the qualified parliamentary majority to send a new constitution to referendum. The Kurdish party in parliament, not coincidentally, held enough seats to help Erdoğan over that threshold. Provided its demands were met, it was the only party willing to even consider the option. As for Gül, he began to emphasize the public contrast between his vision for Turkey and Erdoğan's. Where Erdoğan became increasingly authoritarian, Gül made himself the spokesman for further democratization and reform. As Erdoğan has veered further away from Turkey's European integration—famously suggesting not only that Turkey should join the Shanghai Cooperation Organization but that the SCO is "stronger" than the EU and has "common values" with Turkey—Gül has emerged as the spokesman of Turkey's continued European vocation. Developments have not been limited to posturing. Most important is the consolidation of the Fethullah Gülen movement's support for Gül. Given the financial and media resources available to the Gülen movement, such support is crucial for Gül's chances of standing up to Erdoğan. Indeed, during 2012, organizations associated with the movement, such as the influential journalists and writers unions, began aligning with Gül's positions. During the Gezi Park protests of June 2013, for example, Gül sought to counter Erdogan's harsh stance by making conciliatory statements to protesters. In 2013, Gül and his advisors also appeared to be building an independent political structure to support the president and his agenda, scouting the political scene for potential allies. Indeed, it is possible to draw a profile of the emerging political forces loyal to Gül. One group consists of frustrated AKP members who have tired of Erdoğan, in particular the more pro-European and democratically minded. Deputy Prime Minister Ali Babacan is widely believed to be a leading force in this group. A second consists of people close to the Gülen movement, and a third comprises former politicians aligned with the center-right Anavatan (ANAP) and Doğru Yol (DYP) parties in the 1990s but who have not been active in politics since then. In other words, Gül's political support base is more centrist than the current AKP. Under Gül's leadership, whether as a party of its own or a revamped AKP, this political force would for all practical purposes resemble Turgut Özal's ANAP, which unified religious conservatives, liberals, and Turkish nationalists. Özal may be an example in more than one way. Just like Gül, Özal came from the Orthodox Sunni Naqshbandi tradition, but was conciliatory and strongly pro-Western. When the AKP won power in the 2002 elections, its newfound position of influence brought together a tactical alliance of two Islamic movements from very different traditions: the Naqshbandi-dominated core of the AKP and the movement of the preacher Fethullah Gülen. That alliance was consolidated by the military's electronic memorandum preceding the 2007 presidential elections. Both groups feared that the military—and subsequently the judiciary—were poised to move against them with full force, leading them to work jointly to reduce the military through judicial processes, particularly with the Ergenekon and Sledgehammer plot investigations. The alliance brought concrete results. It was instrumental in helping the AKP survive the closure case in the Constitutional Court in 2008 and in the trials that neutralized forces that opposed the AKP within the state bureaucracy and in civil society. The costs were substantial violations of due process including the outright fabrication of evidence, which undermined the credibility of these cases. Yet these events opened the way for the AKP to schedule and win the September 2010 referendum to amend the 1982 constitution, which transferred control of the judiciary to the ruling Islamic conservative coalition. But the tactical alliance between the AKP and the Gülen movement began to fade once their common enemies had been neutralized. The split between the two has become the central fault line in Turkish politics and merits a closer look at the differences between the groups. The core AKP leadership is a product of the political tradition of the Milli Görüş movement, founded by Necmettin Erbakan, and consists of members and followers of the Iskender Paşa wing of the Khaledi branch of the Naqshbandi order, an order that is unique in tracing its lineage to Caliph Abu Bakr rather than Ali. The Khaledi branch is best known for having reinforced traditional Islamic tenets of the order and for its fierce resistance to the westernizing reforms of the Ottoman Empire in the nineteenth century. The Naqshbandis were driven underground by the proclamation of the Turkish republic and the closure of the religious orders but became increasingly involved in politics after Atatürk's death, seeking to revive religious values in Turkey. This move into politics led to a cross-fertilization with the growing political Islamic movement in the Middle East. Figures like Jamal al-Din Afghani and Sayyid Qutb and the Egyptian Muslim Brotherhood movement formed the intellectual inspiration for the developing Turkish political, Islamic movement. The broader Islamic movement of the Middle East was brought to Turkey by publications edited by Eşref Edip, who had lived in Egypt, was deeply influenced by the Brotherhood, and provided Erbakan's intellectual underpinnings. Milli Göruş is deeply rooted in political Islam, and its members pay less attention to the Turkish ethnic bond than to the broader Muslim identity. Furthermore, after 1979, a considerable portion of Turkish Islamists developed admiration for the Iranian revolution. The Gülen community, in contrast, stems from the Nur movement, which has a tradition of strongly objecting to direct involvement in politics. Its members believe that such involvement would create a conflict of interest and weaken the movement's main aim: to instill in its members, imana hizmet, or "service to the faith." The movement's founder, Bediüzzaman Said Nursi, remained loyal to this tradition and even overtly expressed his disapproval of his friend Edip's establishment of an Islamic Democratic Party in 1951. Some followers of the Nur and Qadiri movements joined with Erbakan in the late 1960s but fell out with him by the mid-1970s. The Gülen movement, however, has traditionally refrained from supporting political Islam and from direct participation in politics: It terms itself "civil Islam" in contrast to "political Islam." It, nevertheless, offered passive support to Turkey's successive center-right parties—the Democrat, Justice, Motherland, and True Path parties, as well as Bülent Ecevit's Democratic Left Party when Ecevit moved to the center in 1999-2002. While these parties included people close to the movement, one would be hard-pressed to identify any core Gülenists in active politics. These parties supported religious freedom and sought to appeal to conservative Muslims and allowed the Gülen movement to expand its role in society, particularly in the areas of education, business, and media. Importantly, the Gülen movement never extended any support to Erbakan. Gülen also developed a new outlook. His movement sought to synthesize traditional Islam and Turkey's modernization. Moreover, his movement was warm to Turkish nationalism, and many of its members had a past in the ülkücü or "idealist" nationalist organizations prior to the 1980 military coup. Many nationalists were also profoundly impressed by the growing international reach of Gülen's schools, in which the Turkish language had a prominent role. This led the Gülen movement to be perfectly placed when the military junta developed the concept of a Turkish-Islamic synthesis to counter what it saw as the main threat, Soviet-supported leftist movements. When the military endorsed the synthesis between Turkish nationalism and Sunni Islam as an official ideology, the main, if inadvertent, effect was to propel the Gülen movement to prominence. 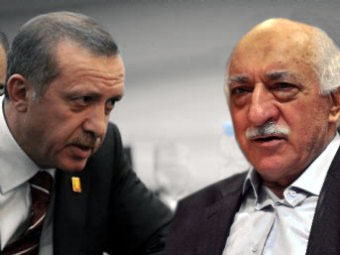 The Gülen movement, with its strong objection to direct involvement in politics, has clashed with Erdoğan (left) on a number of domestic and international issues. The movement's leader, Fethullah Gülen (right), criticized the Gaza flotilla incident, which he termed a "defying of authority" for failing to seek Israeli approval for its delivery of aid. Erdoğan, on the other hand, defended the operation, accusing Israel of using excessive force against the flotilla. Given these diverging perspectives, Erdoğan and the Gülen movement eventually clashed on a number of domestic and international issues. The first public rift was in the realm of foreign affairs. The Gülen movement had expanded its horizons beyond Turkey and became globalized, making it increasingly sensitive to the broader balances and nuances of world politics—in sharp contrast to the narrow mindset characterizing the Milli Görüş movement. As a result, the Gülen movement is notable for the absence of the anti-Western, anti-Zionist, and anti-Semitic reflexes that are prevalent among other Islamic political groups worldwide, including the core AKP. This divergence became evident following the 2010 Gaza flotilla incident, which led to sharp and enduring anti-Israel rhetoric from AKP leaders. But in an interview to The Wall Street Journal that even surprised many of his supporters, Gülen stated his disapproval of the flotilla initiative, which he termed a "defying of authority" for failing to seek Israeli approval for its delivery of aid. Iran developed as another bone of contention. The Gülen movement's media outlets have long been scathing in their rhetoric against the Iranian theocratic regime, in a way that has often generated disbelief among traditional Islamists in the AKP. Gülenists even worked to undermine AKP foreign minister Ahmet Davutoğlu's efforts to improve ties with Iran. It is no coincidence that the December 2013 corruption scandal targeted the Iranian money laundering activities of the AKP government. Domestically, the Kurdish question was the most consequential issue. The AKP's Islamist and liberal wings supported Erdoğan's Kurdish opening as they shared a tendency to downplay Turkish ethnic identity. However, the Gülenists shared the unwillingness of their secular Kemalist predecessors to compromise on the country's unitary structure and the primacy of the Turkish language. The February 2012 crisis was prompted by Gülenist opposition to the AKP's peace talks with Abdullah Öcalan, imprisoned leader of the PKK (Partiya Karkerên Kurdistan—Kurdistan Workers' Party). But more than anything else, the main source of the declining relationship was Erdoğan's personal ambition. The September 2010 constitutional amendments had empowered the Gülenists' influence in judicial institutions because as a movement focused on education, the Gülen movement—unlike the parochial Naqshbandi whose members train mainly in religious imam-hatip schools—could provide qualified candidates for high judicial positions. As a result, the Gülenists' growing influence began to rattle Erdoğan. When Erdoğan prepared the party list ahead of the June 2011 election, few of the estimated sixty or seventy Gülen supporters were left in place, leading to serious dissonance within the movement. Simultaneously, the wholesale reform of public administration by the AKP government was used as an excuse to remove or reposition many Gülenists in the state bureaucracy—particularly in the Ministry of Education, which is dear to the movement's heart. A final element of discord has been in the realm of business. Businesses close to the AKP profited tremendously from public procurement, and the levels of corruption involved in this sector became staggering, particularly after 2011. In this context, Gülen-aligned businesses have increasingly felt left out of state contracts that have gone largely to Erdoğan loyalist companies. Gülenists have also balked at the outright demands for cash kickbacks required to obtain contracts. As the movement is relatively devoid of corruption, it became increasingly alienated by the massive corruption in the leading circles of the AKP. By late 2011, the battle lines had been drawn. In November, columnists close to Gülen warned Erdoğan of the consequences of his "arrogance." To drive home the point on November 23, a full-page article by Gülen himself was published on the concept of arrogance. Erdoğan was not mentioned, but everyone got the message. In February 2012, a prosecutor believed to be affiliated with the movement called in Erdoğan's intelligence chief Hakan Fidan and two of his predecessors for questioning over their role in negotiations with the PKK. This was a direct shot across Erdoğan's bow, and he later indicated his conviction that the Gülen movement sought to arrest him at the time. Since then, Erdoğan has conducted further purges of Gülen followers in key positions in the state. In return, the movement's media outlets have grown openly critical of the government. The rift worsened with the Gezi Park protests of May-June 2013 when Gülen-affiliated media stood out by reporting fairly and critically about the government's repression. The movement's official mouthpiece, the Writers' and Journalists' Union, has since issued several statements featuring sharp criticism of the government's restrictions of the freedom of expression. In Erdoğan's conspiratorial mindset, the Gülen movement was seen as complicit in planning and organizing these protests at the behest of global forces, especially the Jewish world conspiracy Erdoğan believes is plotting his downfall. Any remnants of civility ended in November 2013 when the newspaper Zaman reported that a draft bill was being prepared to close down the private preparatory schools that help Turkish students prepare for the centralized university entrance examination. The Gülen movement operates up to a third of the estimated 4,000 prep schools in Turkey. The schools are an important recruiting tool, and it is there that many if not most of the movement's past, present, and future followers have been identified and cultivated. Erdoğan soon confirmed that he indeed intended to close down the prep school system. He portrayed the move as part of a general overhaul of the educational system and as a step to combat the inequality resulting from students unable to attend such schools being disadvantaged. But had that been the intention, the government would have begun by addressing the problem of which the prep schools are a symptom: a centralized examination system that requires a level and type of knowledge and test skills that the public education system does not provide. The move was thus a transparent attack on the Gülen movement, one the movement interpreted, probably correctly, as the first step in Erdoğan's plan to finish off its influence in Turkey. There is little doubt that this in turn prompted prosecutors to launch the wave of arrests on December 17, 2013, which targeted four of Erdoğan's closest cabinet members, plunging Turkey into a deep, political crisis. The Gezi Park protests of summer 2013 and the December 2013 corruption probe that led to the resignation of four ministers may seem on the surface quite different. The former was a set of popular, spontaneous protests, the latter, a calculated effort to inflict as much damage as possible on Erdoğan's legitimacy. Yet they must be understood as part of the same political process, a reaction from various parts of Turkish society to the growing autocratic tendencies of Erdoğan's rule and its ever more blatant corruption. In both instances, Erdoğan's opponents, whether the millions from all walks of life in the summer protests, or the prosecutors in the corruption probe, targeted neither the AKP as a party nor Islamic conservatism as a movement. Instead they specifically opposed Erdoğan personally and, especially, his autocratic and arbitrary exercise of power. The Gezi Park protests initially arose out of frustration with the AKP administration's plans to demolish one of Istanbul's few remaining green areas to construct yet another shopping mall. Shopping malls and the construction industry are known to be major sources of elite corruption. But the explosion of the protests around the country had nothing to do with the park per se; rather, these demonstrations were a reaction to Erdoğan's harsh and overbearing attitude toward peaceful protests and, particularly, the police brutality committed at his direct orders. As for the anti-corruption raid, there can be little doubt that it was a response triggered by supporters of Fethullah Gülen to Erdoğan's plans to eliminate their clout within the Turkish state. Gülen denies any form of contact with the prosecutors in the case. While that is plausibly true, it is clear through his public statements and sermons that he has taken a more public and aggressive political stance than ever before. His much-noted December 23 mubahala—an Islamic prayer calling for a curse from God on anyone who has committed a transgression—was unprecedented and constituted a direct challenge to Erdoğan's legitimacy. Similarly, newspapers linked to the Gülen movement such as Zaman and Taraf have published incriminating evidence, often obtained in undisclosed ways. Yet crucially, as in the Gezi protests, Gülen's followers are targeting not the AKP as a party but Erdoğan as a person. It is notable that the prosecutors in question undoubtedly possess vast troves of evidence implicating government officials in wrong-doing, yet they specifically chose to target four ministers known to be the closest to Erdoğan. The second commonality tying the Gezi protests and the corruption probe are Erdoğan's reactions. In both instances, the prime minister made stunning miscalculations that worsened his predicament and showed that he is no longer able to read Turkish public opinion. During the summer protests, Erdoğan repeatedly poured fuel on the fire with harsh and degrading statements, on several occasions, breathing new life into a protest movement that showed signs of faltering. As one former AKP member of parliament told this author, Erdoğan's behavior was a textbook case of how not to handle a crisis. And following the corruption probe, he had the bad judgment to hold on to ministers accused of wrongdoing for far too long. Stunningly, he has also failed to reject the allegations, seeking instead to paper them over and explain them away—a tall order when the evidence includes things such as four million dollars in shoe boxes in a state bank director's home. Similarly, Erdoğan's clumsy attempts to prevent the execution of justice by removing police chiefs and prosecutors from their cases and initiating blatantly unconstitutional regulations undermining the separation of powers suggests guilt and a cover-up. 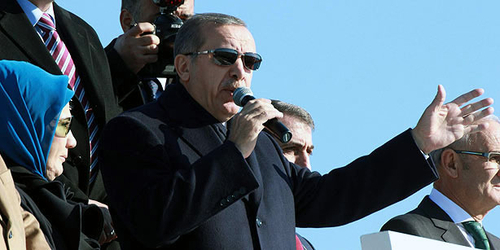 Turkish prime minister Recep Tayyip Erdoğan addresses his supporters in the Black Sea province of Samsun, December 2013. His reaction to the corruption probe against four of his closest cabinet members was to label it a vast, international conspiracy, which included the United States. At the Black Sea rally, Erdoğan even threatened to expel the U.S. ambassador, Francis Ricciardone, as a result. Erdoğan on both occasions showed how dangerously conspiratorial and paranoid his worldview has become. After Gezi, he and his allies infamously blamed the "interest rate lobby," sometimes openly referring to a Jewish world conspiracy and unnamed Western forces seeking to thwart Turkey's rise. And his reaction to the corruption probe was simply to term the Gülen movement agents of this vast international conspiracy against Turkey, which by now included the United States itself. At a public rally, Erdoğan even went as far as threatening to expel the U.S. ambassador, Francis Ricciardone. These were acts of desperation but, unfortunately, appear to reflect the worldview of Turkey's leader. A final common element linking the Gezi protests and the corruption probe are their economic impacts. Turkey is highly dependent on foreign capital inflows, and the government's reaction to both crises appeared to maximize the damage to the Turkish economy. Turkey fared much worse in the second half of 2013 compared to other large emerging economies, which have all been reeling from the expected consequences of the Federal Reserve's "tapering" of its bond-buying scheme. But blaming Western capitalism for Turkey's woes is hardly a way to secure investor confidence. Of course, the important differences between the Gezi protests and the corruption probe should be underlined. 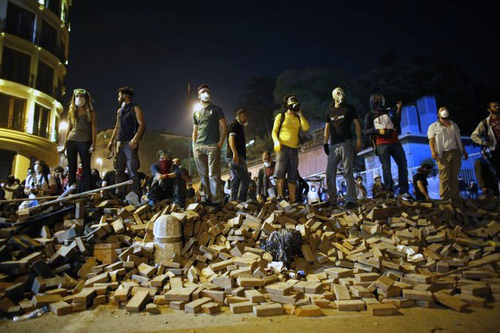 Most obviously, Gezi was a spontaneous mass outpouring of frustration, and because it was unorganized, it failed to translate into a political force. The corruption probe, by contrast, was highly organized and driven by a determined force within the Turkish bureaucracy with a clear purpose—undermining and eventually toppling Erdoğan's rule. It raises obvious questions about this force, which in turn has rekindled a growing debate about the nature of the Gülen movement, its ultimate goals, and not least, the methods it uses. It must be noted that the growth of the Gülen movement's influence stands in contrast to its public assurances of being a non-political, civil society organization solely dedicated to service to society. Similarly, the well-documented judicial excesses of the Ergenekon and Sledgehammer investigations, which the movement unreservedly endorsed and championed, stand in contrast to its stated commitment to the rule of law and Turkey's EU membership process. On the other hand, the Gülen movement is a dynamic social force, which appears to be in continuous evolution, another factor that distinguishes it from the intellectual stagnation and decay of the core AKP. Importantly, the Gülen movement appears acutely aware that direct involvement in politics would doom its cohesion and standing in society. This provides an asymmetry to the current struggle between the movement and the AKP that implies it cannot be interpreted simply as a power struggle between two contenders. Many Turkish experts correctly point out that the risk is instead a return to a form of indirect elite tutelage over Turkish democracy, this time from the Gülen movement rather than the Kemalists, involving unelected forces limiting the workings of the political system. And indeed, if the Gülen movement manages effectively to help topple Turkey's strongest politician since Atatürk after having helped topple the military tutelage regime, all political forces in Turkey are likely to think twice before defying the movement. That said, the Gülen movement is a reality in Turkish society. As a strongly rooted network without parallel in the country, no one should doubt its staying power, or that regardless of the outcome of the current crisis, it stands to wield significant influence over Turkey's direction in coming decades. The same cannot be said about Erdoğan. For nearly a decade, Erdoğan's control over Turkey has been taken for granted. Observers routinely (and correctly) decry the absence of a viable opposition and have concluded that Erdoğan is likely, health permitting, to rule Turkey unopposed for another decade. From that vantage point, the recent crises may seem like mere bumps in the road. But analysis points to a diametrically different conclusion. In fact, over the past several years, Erdoğan's autocratic tendencies have had the inadvertent effect of hollowing out his own coalition. It should be recalled that Erdoğan himself, in 2002, received 36 percent of the vote with a party that was barely a year old. In Turkey, political fortunes can change fast. Moreover, Erdoğan seems to have increasingly concluded that he embodies Turkey's public opinion. Thus, he projects and imposes his own views and values on Turkey. But a country that only just emerged from the Kemalist republic's top-down social engineering has little appetite for an Islamist variant of the same, certainly not a one-man version. This explains the Gezi protests but also why so much of the Islamic conservative movement in Turkey opposes Erdoğan's ambitions. Unlike Erdoğan, many appear to understand that the country is too diverse to be fitted into any ideological straitjacket, and many view him as outright counterproductive—even dangerous—to their aim of a more pious society. The corruption charges are likely to broaden that assessment as they pierce the veneer of piety that has been Erdoğan's key political asset. Since the point when Erdoğan decided to become, in effect, an elected sultan—or an Islamic caudillo—his days at the helm of the state were numbered. With every move to concentrate power, he has lost further legitimacy and support within society as well as in his own power base. His irrational behavior and conspiratorial worldview, furthermore, make him seem increasingly a liability to his erstwhile political allies. These supporters will follow him and support him only as long as they calculate this is in their political interest over the medium to long term. So far, that equation has been simple: Erdoğan has been unmatched as a leader of the conservative movement and as a campaigner in elections. But in 2013, his aura of invincibility and his very legitimacy were pierced by the Gezi protests and severely shaken by the corruption probe. In addition, it is crucial to note that Erdoğan's international legitimacy as a democrat and statesman has been shattered. Both Turkey's Islamists and their opponents believe that the West's backing was a key factor keeping Erdoğan in power, preventing both a military coup in 2007 and the judiciary's efforts to close down the party in 2009. That belief is what has made Turkey's secularists so deeply anti-American. As they see Erdoğan lash out against the West, they conclude that such support is no longer forthcoming. That, in turn, makes Erdoğan all the more vulnerable in the public perception. It is a safe bet that Turkey's Islamists (and their fellow travelers) must be calculating whether or not it is in their interest to see Erdoğan continue in power. He has not yet reached the tipping point where most conclude they are better off without him, but he may be approaching it rapidly. The number of resignations from the AKP parliamentary group is mounting. Importantly, it is an open secret that a considerable minority of the cabinet as well as the parliamentary group may be willing to switch its allegiance from Erdoğan to President Gül. Not least, AKP internal rules prohibit anyone, including Erdoğan, from being re-elected to a fourth term. While that rule could still be changed, several dozen parliamentarians would be unable to seek re-election under the current rules, fomenting discontent. The December 2013 corruption probe was just the beginning of damaging allegations targeting Erdoğan. His situation is likely to worsen. When the tipping point is reached, events are likely to unravel very fast as the AKP rank and file seek to save the party's position of power. Erdoğan is a talented politician and may yet find ways to survive this crisis as a weakened leader. His main asset is the sense of unity within the core AKP that provides a strong antidote to an overt split; no one including Gül wants to bear responsibility for splitting the party of power. Even the Gülenists appear to see a united AKP—but without Erdoğan—as the ideal outcome. But even if Erdoğan succeeds in staying in power, his chances of achieving one-man rule are now largely illusory. He could change party rules and seek a fourth term or, more likely, open an escape hatch and seek to be elected president under the current constitution. This would lead to his gradual loss of influence over day-to-day politics. In any case, it is more than likely that the Islamist movement that he led to unprecedented dominance over Turkish politics will soon conclude that Erdoğan has done his part. It is, therefore, important for Western observers to begin thinking of the post-Erdoğan period, even if that may not be imminent. What, then, would a post-Erdoğan Turkey look like? This will be the moment of truth for Turkish "moderate" Islam. At first sight, Turkey's trajectory over the past several years suggests that even in the best possible circumstances, political Islam will be unable to shake its undemocratic, authoritarian, and intolerant characteristics. Even Turkey's largest Islamist community, the Gülen movement, now implicitly acknowledges this, opposing the very notion of political Islam. But so far, Islamists have been able to say with some justification that the problem is not political Islam but Erdoğan as a person. The track record of Erdoğan's successors will determine whether political Islam can redeem itself. Svante E. Cornell is director of the Central Asia-Caucasus Institute and Silk Road Studies Program, affiliated with Johns Hopkins University's School of Advanced International Studies and the Stockholm-based Institute for Security and Development Policy. He is the editor-in-chief of the center's biweekly, The Turkey Analyst. Milliyet (Istanbul), July 16, 1996. M.K. Kaya and Svante E. Cornell, "Turkish Political Corruption: The AKP, Too?" Turkey Analyst, Sept. 25, 2008. Today's Zaman (Istanbul), Apr. 20, 2010. Halil Karaveli, "Referendum Victory Opens the Way for Erdogan's Presidency," Turkey Analyst, Sept. 15, 2010. Gareth Jenkins, "Erdoğan's Volatile Authoritarianism: Tactical Ploy or Strategic Vision?" Turkey Analyst, Dec. 5, 2012. Tobias Brunner, "Verschwörungstheoretiker wird Erdogans Chefberater," Der Spiegel (Hamburg), July 10, 2013. Akşam (Istanbul), May 7, 2012. The World Tribune (Washington, D.C.), Mar. 24, 2012. Today's Zaman, Dec. 4, 2011. Halil M. Karaveli, "Erdoğan's Way: Confrontation at Home and Abroad May Be Backfiring," Turkey Analyst, Nov. 21, 2012. The Diplomat (Tokyo), Dec. 1, 2013. For more information on Sledgehammer, see Gareth Jenkins, "The Snake That Doesn't Touch Me: Turkey's Special Authority Courts," Turkey Analyst, Mar. 5, 2012; for Ergenekon, see idem, Between Fact and Fantasy: Turkey's Ergenekon Investigation (Washington, D.C.: Central Asia-Caucasus Institute/Silk Road Studies Program, 2009). The Wall Street Journal, June 4, 2010. Fethullah Gülen, "Çağın Ruh Hastaliğı Kibir," Today's Zaman, Nov. 23, 2011. See, for example, Reuters, Feb. 7, 2014. YNet News (Tel Aviv), June 14, 2013. See, for example, The World Post (New York), June 9, 2013. Marc Champion, "Does Erdogan Really Believe in an Interest-rate Lobby?" Bloomberg News Service (New York), June 28, 2013. Related Topics: Turkey and Turks | Svante E. Cornell | Spring 2014 MEQ receive the latest by email: subscribe to the free mef mailing list This text may be reposted or forwarded so long as it is presented as an integral whole with complete and accurate information provided about its author, date, place of publication, and original URL.